The way I see it, you need these on speed-dial: a plumber, mechanic, lawyer, and in my house, a chicken place that delivers. I would add to that, a good psychic. I’m not talking about hitting up Madame Lasagna at the boardwalk. I’m talking about those of us who are truly, sharply tuned in to the intuitive side. That kind of information gives you a new (and sometimes better) way to deal with modern challenges. For the record, this is NOT me. Ever since the first human wondered if the person in the next cave over liked them or not, humans have sought ways to see what couldn’t be determined by other means. Psychic ability lets us pull back from what’s in front of us, and sense other things at play. The psychic’s brain downloads on a completely different channel and offers another source of information. Intuition is a nice counterbalance to the super-tech, pointy-headed vibe of this 21st century life. It’s more organic. Your iPhone can do a lot of things, but picking up psychic info ain’t on the list. Can find you a restaurant, can’t solve your relationship crisis. Maybe that’s why I’ve seen such a huge increase in people coming for a reading whom you might not expect: a tough Irish cop, a psychoanalyst, a surgeon, for starters. They’re finding a new way around their problems, by tapping into this age-old data stream. If you’re still kicking the idea around, here are my 3.5 reasons to consider a psychic. Can this help me find where I parked at the mall? When the same annoying situation/person keeps showing up in your life, there’s a reason. Yes, really. The Universe is trying to get your attention, or to provide a lesson. What is that lesson? An intuitive can give you the crib sheet and show you how to finally move forward. Check the frownlines on your face: we spend so much time grinding our mental gears, trying to work out a solution to a problem. A reading might save you on some Botox. Just sayin. Sometimes, you need to take the brain out of it – and see what instinct and the heart has to say. That’s the specialty of a psychic. Add that info to the intellectual mix, your own knowledge of the situation and you’ve got something you can really work with in solving a problem. Connecting with someone you’ve lost is incredibly therapeutic. I’ve had clients finally be able to drop all kinds of baggage after getting a message from someone who’s crossed over. It’s not only intensely liberating, it’s a big comfort, as well. The right psychic-medium can hook you up on that channel. When it comes to finding an intuitive, I strongly believe in personal recommendations. You want a good fit – and a truly professional intuitive won’t mind if he/she isn’t the right one for you. Let me just add that a responsible psychic will only ask for his/her standard fee (and not hit you up for “extras,” like “removing curses”); and if someone’s issues are above their paygrade, they’ll suggest a qualified mental health professional. At any rate, if you’ve ever rolled your eyes at the thought of consulting a psychic, open your mind. This ancient art is more 21st century than you think. I admit it – when it comes to nurseries, garden centers or roadside plant sales, I’m like a crackwhore. My happiest mornings are when, coffee in hand, I can walk up and down the rows at my favorite garden place, picking up a new plant or flat of annuals to brighten up my yard. Screw Disney — this is the Happiest Place On Earth. Gardening is what I call “dirt therapy.” And it serves an additional purpose, grounding me after spending time in the psychic realm. Many times after a reading, I will get down and dirty – literally – throwing on my work shoes for a quick round of weeding. Putting my hands in the earth balances out the buzzy energy in my head. If I can’t weed, I’ll step outside and just place my hands on the ground. Even if you’re not psychic, we’re all under a heightened barrage of energy these days, the kind that keeps us in our heads. Texting, email, watching cat videos on YouTube – all the time we spend “connected” does a number on us. Exhibit A: look at any kid at the mall, zombie’d out on their phones. Need I say more? Anyway, I think that’s one reason we see so much anxiety and depression. Yes, there may be other medical reasons, but when your brain is jumping all over the place, looking for the next bit of stimuli, well, that can’t be good. In fact, I read of a new phenomenon called “popcorn brain.” The name says it all. Balancing out all that mental energy with something physical is good for you in so many ways – and will keep you psychically healthy. I tell my students that they should do something grounding after reading: play with your dog, go for a walk, eat something, share some hot monkey-love with your honey, or plant up a pot of geraniums. The point is to keep your channel from going all flookey. Psychic energy has a component of electricity to it. One needs to ground that special brand of electricity or you’ll burn your mental house down. I’ve seen it, especially among people just opening their channel. So be responsible with your instrument. And meet me at the garden center for some dirt therapy. Got questions about this? Hit my website for more info. I still remember the first time I ever used a Ouija board: I was in fifth grade, having a sleepover with my friends. After a long, giggly debate, we decided the dead person we most wanted to contact was….Betsy Ross. Go figure. 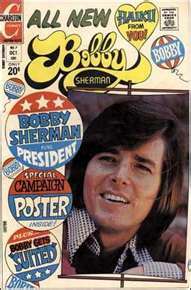 (I voted for Bobby Sherman, but he wasn’t dead– a minor technicality). Anyway, we shut the bedroom door, lit a candle, gathered ‘round the board….and promptly had the crap scared out of us when my mother (listening on the other side of the door) gave a spooky “Woooooooo.” Cue the sound of high-pitched squealing 10 year olds. Ouija boards have a reputation, which hasn’t been helped by a long line of stories starting with “I heard about this guy who….” or movies where they burst into flames. But I personally don’t believe they are the default gateway to the demonic, and here’s why. 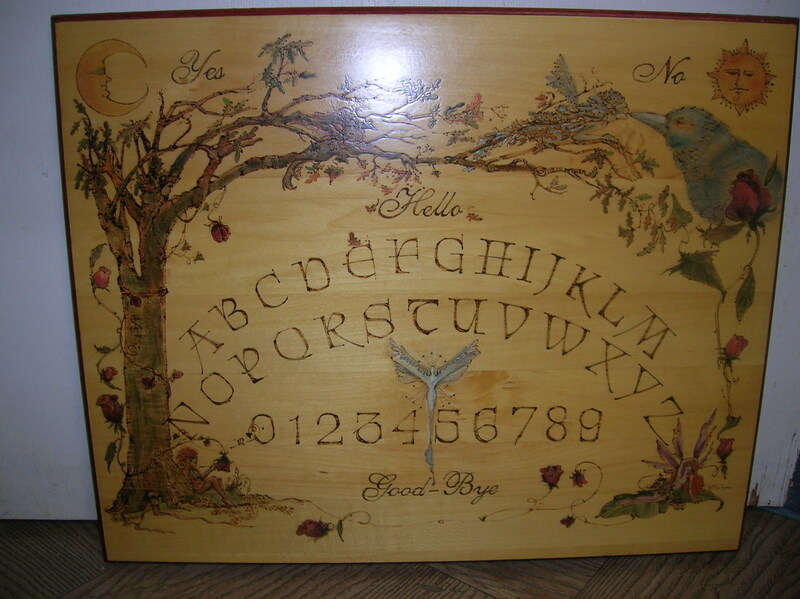 The board is a way of communicating with the spirit world. Like any work with spirit, certain precautions are necessary. Whenever I do a reading, meditation, etc, I make a habit of surrounding myself with the white light of love and protection. I declare that only positive and helpful entities be allowed into this circle. To me, this is my “Beware of Dog” sign to any spirit that might want to make mischief . The same kind of precautions apply when working with a Ouija board. You only want “good spirits” to come through. 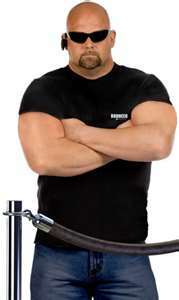 And here’s one more thing I learned from a very experienced medium: have a bouncer. She works with a board all the time, but generally gets the information from one spirit guide alone. When she wants to communicate with a different spirit, that guide steps aside – but keeps an eye out in case things start to go off the rails. He has the power to tell that troublesome entity to hit the road. Several years ago, I had a Wiccan friend of mine make a Ouija board for me. See how beautiful it is? She put a lot of positive energy into it – and added one special touch on the back: the engraved message, “with harm to none.” When I work with this wonderful board, I have one of my guides serve as my doorman. I also make sure to start every session with positive intentions and the circle of protective light. Having said this, however, I don’t recommend working with a board casually.Like chainsaws, explosives or PowerPoint, you need to know what you’re doing. It’s just good sense. 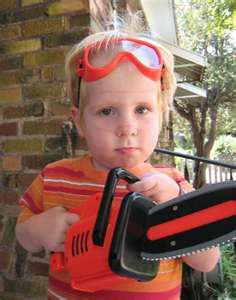 Kids and chainsaws….never a good mix. As for all those tales of spooky Ouija boards? Wait…it’s spelling out something….”Forget….about….it….”!